Blue Peaks Track, Central Plateau, Tasmania: It’s an early Friday afternoon, early autumn. The weather is benign, so is the company. And yet there’s turmoil on the track. It’s a turmoil that matches the lead-up to this trip. Bushwalking isn’t supposed to be like this. It’s usually a simplified, pared down existence. Challenges are defined, and everyday cares are excluded from the rucksack. 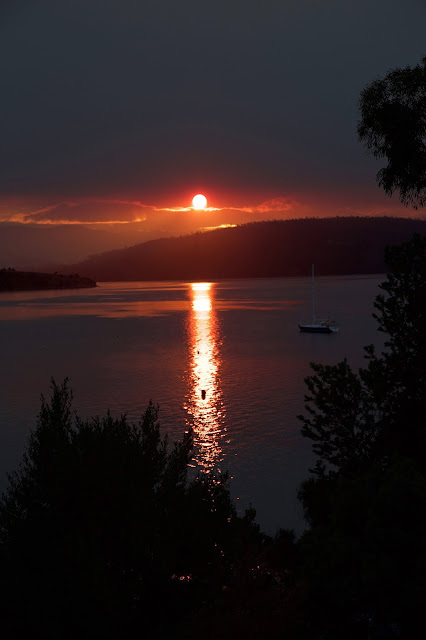 It was this summer’s fires that changed all that. In the weeks leading up to the trip the six of us have exchanged dozens of emails, made numerous phone calls. Plan A has been in, then out, then in again … possibly. We’ve discussed Plans B, C, D and more in detail. Our decision has depended entirely on whether the Mersey Forest Road would open again after a prolonged fire-caused closure. The uncertainty has robbed us of anticipation, one of the pleasures of any trip. I’ve even been waking in the wee hours, my mind going through the options, struggling to match the preferences of our walking party to the potentially available routes. It’s not until we’re half way up the Midland Highway on our first day that we make the final call. Rumour has it that the Mersey Forest Road will open tomorrow morning. It’s too late. We’re off to the Blue Peaks again. Tim O and I might have just been there in December, but the others haven’t, and the road is definitely open. There’s one other definite. We’ll be walking into one of the recent fire zones. 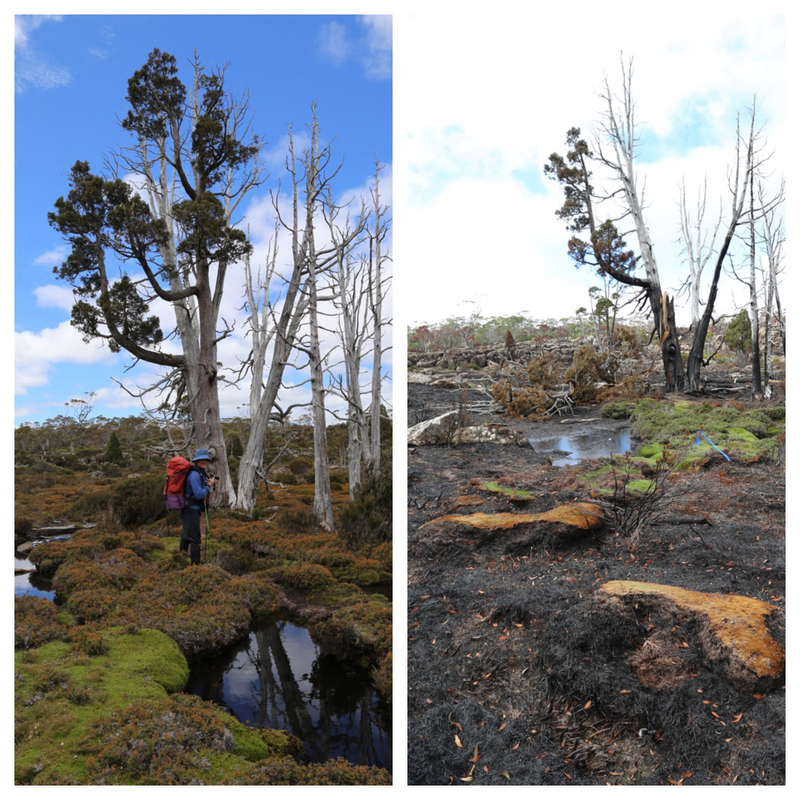 And it’s the aftermath of the Lake MacKenzie bushfires, just a few hundred metres up the track, that is the cause of more turmoil. 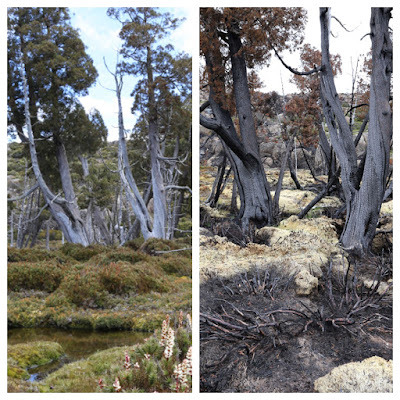 As we climb the slope away from Lake MacKenzie, the bush is its usual muted, mottled green. Then, as we round a bend at the top of the slope, the ground is suddenly bare. The varied greens are replaced by basic black and brown, a 3D landscape now two dimensional. We’ve been expecting a bleak scene, but not this assault on every sense. Of course it’s visually awful, with blackened, twisted, bare and broken bush, and barely anything still green and growing. Even the puddles created by recent, too-late rains seem singed, filled with sooty sludge and burned debris. And the bush also smells like death. Beyond the burning of leaf and limb, there’s the whiff of scorched soil and of countless other incinerated living things. We even see leeches fire-frozen in the act of stretching. But it’s the sounds – or the lack of them – that haunt me the most. Although there’s a breeze, with no leaves to rustle the wind has no voice. Not one bird calls: not even a raven or other carrion chaser. We too are silent, walking slowly, taking ghoulish photographs, deep in our own thoughts. I’ve studied fires for years, and have been in fire zones before. I know that much of this bush will slowly recover. It will just need time. Indeed in some places there are already a few tiny green shoots. But while there will be some healing here, it’s the things that will never recover that have me the most concerned. And sure enough, around a corner we meet our first forever fatalities. Just two months back Tim and I had paused for photos at the track’s first prominent pencil pine. 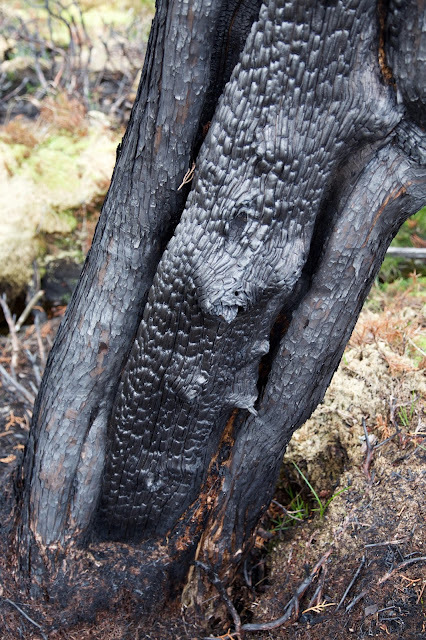 An old survivor, this scarred but living pine stood next to others that had succumbed to past fires. Perhaps its sodden home, among sphagnum and cushion plants, had offered it some protection. This time it hasn’t been so lucky. One large limb, ripped from its crown, lies ruined and brown beside it. Its one remaining limb has been singed, though for now it’s still green. Near its base, the normally plump green cushion plants are a sickly brown and yellow: deflated, defeated, doomed. 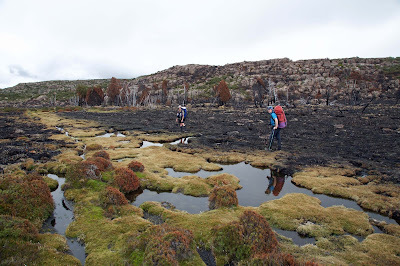 So too are the desiccated sphagnum beds. We walk on through this strange half-dead landscape. The chaos that is fire has left some patches entirely unburned. Parts of our track are a bizarrely green ribbon through brown, burned barrens. The waterlogged scoop of many footfalls has protected it. But the saddest sights for us are the fatally burned pencil pines. One large stand along a sodden, sphagnum-filled creek that would normally be its salvation, has been almost entirely cremated. We won’t see them here again. Twenty minutes later we leave the burning zone. The air has started to feel refreshed, and we hear birds and even frogs again. 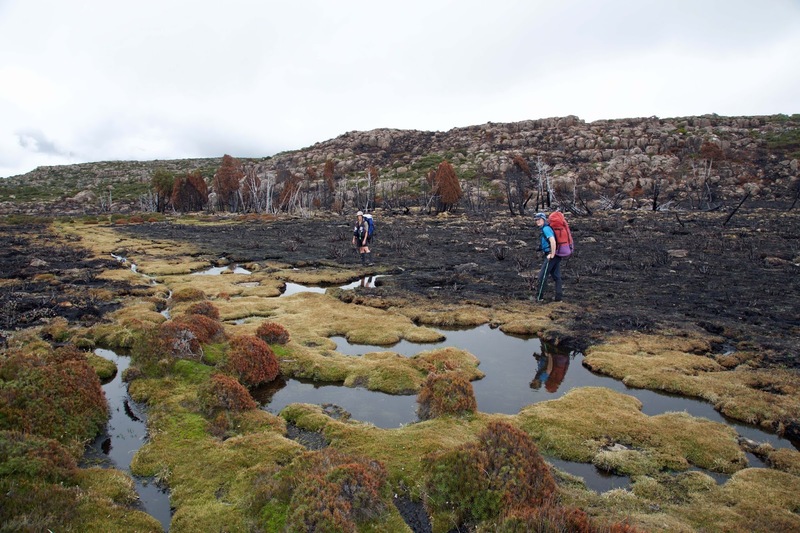 The bush is now its familiar khaki mix, and we turn our focus to the hard work of walking. We hope we’ll soon reach the unburned refuge of our pencil pine-fringed campsite beneath the Blue Peaks.